A2 Shade, Temporary Crown and Bridge Material, 1 - 76 gram Cartridge. Lidocaine HCL 2% with Epinephrine 1:100,000 Local Anesthetic, Box of 50 - 1.7 mL Cartridges. Articaine 4% with Epinephrine 1:100,000. Box of 50 - 1.7 mL Cartridges. Mepivacaine 3% Local Anesthetic PLAIN, Box of 50 - 1.7 mL Cartridges. Bausch .008" (200 microns) BLUE Articulating Paper Strips, REFILL Box of 300 Strips. Blue 25 gauge Etchant Tips - Pre-Bent Applicator Needle Tips, Package of 100. Black 20 gauge Flow Resin Tips - Pre-Bent Applicator Needle Tips, Package of 100. 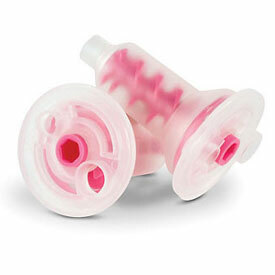 Filtek Supreme Ultra Flow - A2 Syringes, Flowable Restorative. Box of 2 - 2 Gm. Syringes & 20 Tips. Etch-Rite Etching Gel 24/Pk. 38% Phosphoric Acid, Bulk Kit: 24 - 1.2 mL Syringes. Brush & Bond Dentin/Enamel Bonding Liquid, 3 ml bottle liquid only. Filtek Supreme Ultra Flow - A1 Syringes, Flowable Restorative. Box of 2 - 2 Gm. Syringes & 20 Tips. Etching Gel, 37% Phosphoric Acid, 4 - 1.2 Gm. Syringe and 8 Tips. Etch-Rite Jumbo Syringe Refill - 38% Phosphoric Acid Etching Gel: 2 - 25 mL Syringes. #4 Upper Right 1st Primary Molar Stainless Steel Crown Form, Box of 5 Crown Forms. #4 Lower Left 2nd Primary Molar Stainless Steel Crown Form, Box of 5 Crown Forms. #5 Lower Right 2nd Primary Molar Stainless Steel Crown Form, Box of 5 Crown Forms. #5 Lower Right 1st Primary Molar Stainless Steel Crown Form, Box of 5 Crown Forms. #5 Lower Left 2nd Primary Molar Stainless Steel Crown Form, Box of 5 Crown Forms. #2 Lower Left 1st Primary Molar Stainless Steel Crown Form, Box of 5 Crown Forms. #4 Upper Left 1st Primary Molar Stainless Steel Crown Form, Box of 5 Crown Forms. #4 Upper Left 2nd Primary Molar Stainless Steel Crown Form, Box of 5 Crown Forms. #6 Lower Left 1st Primary Molar Stainless Steel Crown Form, Box of 5 Crown Forms. #2 Lower Left 2nd Primary Molar Stainless Steel Crown Form, Box of 5 Crown Forms. #4 Upper Right 2nd Primary Molar Stainless Steel Crown Form, Box of 5 Crown Forms. #7 Lower Right 2nd Primary Molar Stainless Steel Crown Form, Box of 5 Crown Forms. #2 Upper Left 1st Primary Molar Stainless Steel Crown Form, Box of 5 Crown Forms. #7 Upper Left 1st Primary Molar Stainless Steel Crown Form, Box of 5 Crown Forms. #4 Lower Left Molar Stainless Steel Crown Form, Box of 5 Crown Forms. #5 Lower Right Molar Stainless Steel Crown Form, Box of 5 Crown Forms. Plain Wrapped Cotton Rolls 1-1/2" x 3/8", #2 Medium Non-Sterile, Box of 2000. 6" Non-Sterile Cotton Tip Applicators, Box of 1000. 9.5" x 14.5" Clear Plastic Headrest Cover, box of 250 Covers. Blue 5 oz. Plastic Cups 1000/Cs. Endo Foam Inserts - White, Package of 48. Air/Water Syringe Tips A-Dec Style, Autoclavable, package of 5. Piezo Ultrasonic Scaler with Tips; Detachable Handpiece includes 5 free tips. Small Disposable Surgical Aspirating Tips 25/Pk. Cuspidor Strainer / Trap #6400, 144/Bx. 1-5/8" diameter, fits A-dec Cascade and Performer Cuspidors. Intra-Oral Tips, Yellow 100/Bag. Fits 4.2 mm mixing tips. Bite Registration material - Fast Set, Unflavored, Package of 2 - 50 ml cartridges. Bite Registration material - Super Fast Set, Unflavored, Package of 2 - 50 ml cartridges. High Performance Mixing Tips - Large (6.5mm), Teal. 50/Bag. Quadrant Bite Tray, box of 35 bite trays. Cartridge Dispenser Gun for 50ml Impression Material, 1:1, Single Dispenser. Disposable Impression Material Syringe, Box of 50 Syringes. Curved Utility Syringe, Package of 50. HP Intraoral Tips, Clear 6.5 mm. Bag of 100 Tips. 2.5" x 10" Clear Air/Water Syringe Sleeve with Pre-Cut Opening. Box of 500. Compare to Crosstex. Blue Fluid Resistant Ear-Loop 3 ply face mask with 98% filtration at 2 microns, box of 50 masks. Latex glove: Non-Sterile, Powder-Free, box of 100 Large gloves. Latex glove: Non-Sterile, Powder-Free, box of 100 Medium gloves. Latex glove: Non-Sterile, Powder-Free, box of 100 Small gloves. 3" x 3" Poly Coated Mixing Pad, Single Pad. Amoxicillin 500 mg, Bottle of 500 Capsules. Ibuprofen Tablets, 800 mg, Bottle of 500 Tablets. 0.12% Chlorhexidine Gluconate Oral Rinse, 16 oz. Bottle. Duraflor Sodium Fluoride Varnish (5%), Raspberry, 32 - 0.40 mL Unit Doses. Duraflor Sodium Fluoride Varnish (5%), Raspberry flavor, Clinic pack of 200 - 0.4 mL Unit Doses. Duraflor Sodium Fluoride Varnish (5%), Yellow, Bubblegum flavor, 10 mL Tube. Prophy Angles, Firm, box of 144. 5% Sodium Fluoride Varnish - Spearmint Flavor, Box of 50 - 0.40 mL Unit Doses. Dental Floss Threaders, 5 per Envelope, 100 Envelopes per Box. 6" x 12" blue sensitive, panoramic X-Ray film, box of 50. #2 DV-58 Film - Periapical X-Ray Film in a single film vinyl packet. Box of 600 packets.